We have a vegetable garden and as most people, enjoy the multitude of zucchinis that the plant offers. In fact by the middle of the summer I am usually searching for new and interesting zucchini recipes. I came across this one a while ago and it only required a few changes to make it a vegan recipe. It is a simple salad to make and present in an elegant way. We hope you enjoy it as much as we do. 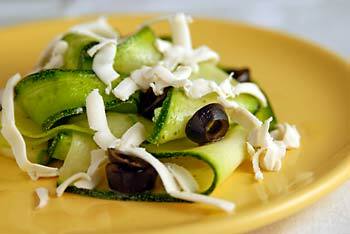 Wash the zucchini and using a vegetable peeler, slice it into ribbons. Make a dressing from the lemon juice, olive oil, salt, parsley and freshly ground pepper. Pour the dressing over the zucchini and allow them to marinate for about a half hour before serving. Place the zucchini on a bed of lettuce or baby leaf spinach. Sprinkle the olives on. A bit more parsley and the grated cheese. Posted by Chris Walker on November 22, 2006 in Salads, Soy cheese, Zucchini.